Once you've ended a review cycle, an Admin has the ability to re-open the review cycle for an individual reviewee so that reviewers who were not able to submit reviews for that employee (reviewee) in time, can go back in and do so. When a review cycle ends, you'll see that the review status by navigating to the "Admin" panel found in the navigation bar, and then clicking on "Reviews" found in the left Administration panel. Next to the review cycle, you will see Auditing as "Ended." When you click into that review by clicking "View Results," you'll be taken to the "Final results" page. To re-open an individual employee's review, you'll want to click back into the completed "Reviews" stage. Once you're in the Reviews stage, you'll want to click the ellipses to the right of the reviewee that you want to re-open the review packet for. This will change their status from "Closed". If you click into the row, the context panel will open for you to see which reviewers still need to complete reviews for that person. The reviewers who haven't submitted their reviews will not be able to go back in and do so. 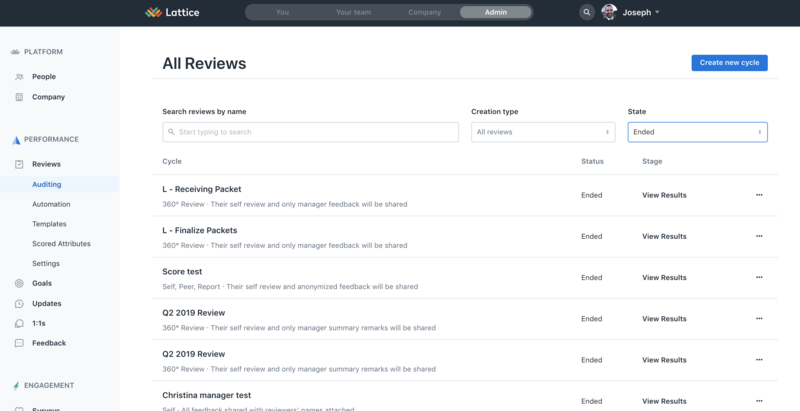 Employees who still need to write reviews for the reviewee will then see a task on their "You" page to perform the review for the ended review cycle. Once the late reviewers have all submitted their reviews on the reviewee, the reviewee status will be "completed." In the context panel, you can click the ellipses next to the reviewee's name and close out the reviewee so that the manager can share the completed review with them.